It's funny how I never paid attention to the British designer Jasper Conran. In my mind he was just Sir Terence Conran's heir, the creator of one my favorites stores: The Conran Shop. 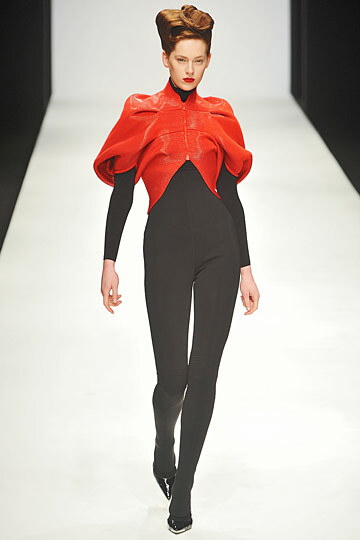 Until today, when I looked at his Fall 2010 collection. It's very architectural, graphic, modern and feminine...everything I love! Conran plays with textures, and make matte and shiny fabrics work together. He plays with contrasts with bright colors against grey and black. It's tailored and wearable, yet some pieces definitely have an edge. I understand it's probably not everybody's cup of tea, but personally, I could definitely wear most of his designs.